When the House’s Stop Online Piracy Act (SOPA) and the Senate’s PROTECT IP Act (PIPA) were put on hold late this week, many had cause to celebrate, including Internet companies, free speech advocates, and the millions who signed petitions against the bills. Their objections have been well enumerated: The bills do nothing to meaningfully reduce, let alone stop, online piracy; their proposed regulations would shut down fair exchange on the Internet; and they threatened to completely disable websites that host user-generated content, like Facebook and YouTube. How will the United States look internationally, advocates of Internet freedom argue, if our nation’s own anti-piracy laws undermine the fundamental characteristics of the Internet? As Wendy Seltzer, a Fellow with Yale Law School's Information Society Project, told me via e-mail, restricting lawful speech potentially “sets a bad example for authoritarian regimes, even as we try to convince them to stop Internet censorship of political organizing or dissent.” Journalist Rob Fischer expressed a similar concern in the American Prospect: “The international community might conclude that, in some cases, the United States prioritizes intellectual-property rights over the right to free expression.” If SOPA or PIPA were to pass, how might China or Iran react the next time American policy-makers object to Internet censorship practices in those countries? The threat goes beyond public relations, though. More specifically, legislation like SOPA and PIPA could inadvertently shut down exactly the kind of Internet-freedom programs that the U.S. government currently embraces and promotes. “[T]he kinds of circumvention tools supported within human rights communities and by the U.S. government as part of its Internet freedom initiatives against authoritarian censorship are precisely the tools targeted for elimination under SOPA,” writes Jonathan Zittrain, co-founder of Harvard Law School’s Berkman Center for Internet and Society, in a research paper on his blog. Seltzer shares the concerns. The statute “might chill the development of anti-censorship tools funded by our State Department,” she writes. Seltzer argues that SOPA and PIPA would make America’s Internet environment resemble China’s “great firewall.” There is a technical Domain Name System (DNS) White Paper circulating on this fear as well, issued by DNS expert Steve Crocker and other concerned computer scientists. 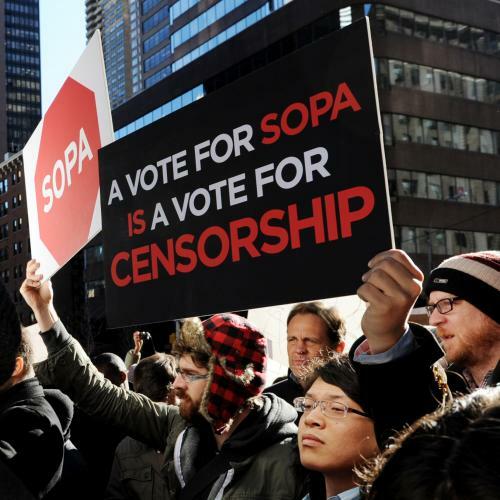 As many have argued this week, SOPA and PIPA are bloated, draconian censorship bills that are out of touch with the technology needs of the average consumer—a “blunderbuss solution that chills or prohibits a great deal of fully protected and legitimate expression,” wrote constitutional law professor Laurence Tribe in a letter to Congress while retained by the Consumer Electronics Association. But the additional, potential damage to the fostering of free speech worldwide should not be ignored. If we’re hoping for another Arab Spring in 2012, the passage of SOPA and PIPA might have severely hindered the thaw.